An example of services provided through the program was when Virginia Supportive Housing (VSH), a not-for-profit that provides permanent housing with support services, requested help to make modifications to the eight-room Brain Injury Center (Bliley Manor) in Southside Richmond. 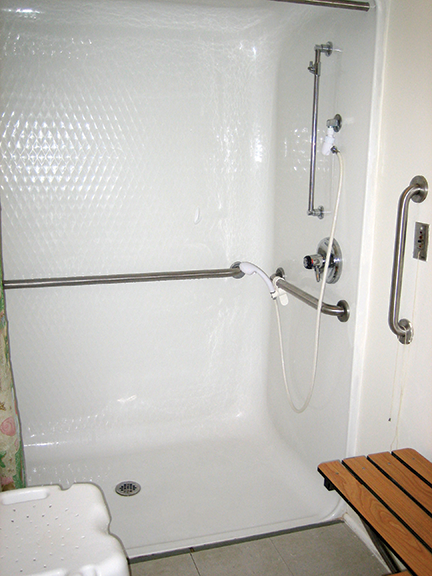 As a result, each room was equipped with an ADA toilet seat, vanity with new faucets and handles, medicine cabinet, shelving fixture, towel and grab bars, and a 3.6 CF refrigerator. Working together with a variety of interested stakeholders is part of what makes this strategic initiative successful. The grant program is promoted on VirginiaHousingSearch.com, AccessVa.org and vhda.com/AccessibleRentalHousing. For details, contact Community Outreach Grant Coordinator Debbie Griner at 804-343-5579 or Debbie.Griner@vhda.com.